I'm Not Skinny: Looking for the perfect Christmas gift? 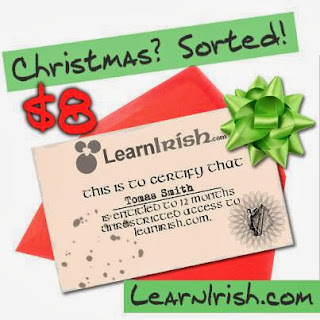 LearnIrish.com nailed it! Looking for the perfect Christmas gift? LearnIrish.com nailed it! Did you know that Irish is one of the oldest written languages? I didn't not until I ran across LearnIrish.com. I also learned that Irish Gaelic, is classified as a vulnerable language according to Google's Endangered Language project. No good! I'm a lover of languages, all of them. I intend on learning as many of them as I can. I have French down, German is a work in progress and next up is going to be Irish with LearnIrish.com. I'm excited for this project to happen it's a really affordable way to learn a language. The early bird price is $8 for a year subscription. That's amazing! The program will include forums, a mobile app and native speaking resources. I love the idea of the language mobile apps. They make it so easy to refresh and learn on the go. I'm so excited for this! In a funny twist of fate my Fella is an Irishman and I'm stoked to start this and to attempt to show off, fail miserably and laugh about it...until I get awesome. I had never considered learning Irish, but now I'm super excited to do it. Head over to LearnIrish sign up! Then encourage others to help you save a language. The price point on this is just outrageous. I can tell you that I've bought several language programs and while they have been fantastic, they are big expenses. $10 for 3 accounts - amazing! Plus there's still the early bird price of $8 for 12 months. It's just fantastic. Again a PERFECT Christmas gift! *Disclosure, I will be receiving the service for free in exchange for this promotional post. That being said, I would absolutely pay for this! I am the exact same. Every since i was an school, I loved learning new languages. Now Irish is one I never thought about learning, but you have definitely peaked my interest! I love the idea behind this program...especially since so much comes with it..the app and forums. Definitely going to check it out! Thanks for sharing! Wow! Only 8 dollars for the full year. That is pretty amazing! I'm working on Spanish right now but I'm totally going to check out Irish as soon as a I get un minuto <<< Check out the Spanish skills! LOL! This looks really cool. When I think of Irish I think of Tom Cruise in Far and Away. lol. Great movie and I really love the accent. I think it would be a lot of fun to learn Irish. Thanks for the great review.